There's a lot of research that goes into every bit of riding gear that ends up on the market. From testing materials for their abrasion resistance to actually testing the product on the track, there are a lot of steps that manufactures take before they put their names on the gear. It's nice to know that, if you're spending good money on a pair of riding boots, there was a great deal of thought behind them before you slipped your feet in. The GMX Boot, made by Gaerne, is a boot that is designed in the spirit of riding. The aggressive, sporty look will match any sport bike's style. Gaerne uses strong materials to create a comfortable, lightweight fit that won't add any extra fatigue to your ride. The low toe box is designed for easy shifting, and the lightweight shank makes it easier to feel what you're doing so you don't accidentally skip through gears. The extra inner padding provides even more protection while adding to the comfort. Gaerne developed a sleek new buckle system for the GMX boots, which creates a positive closure. You're not going to be riding down the road and have a buckle come undone because of running over a pothole or moving your foot around. It shows that Gaerne did some research before pumping these guys out. 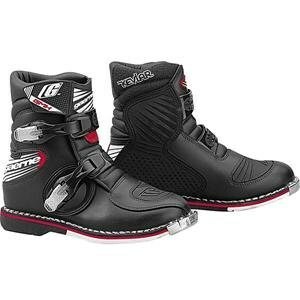 Click here to find this boot on Revzilla.com.